This amazing insect has quite the job description. She will literally work herself to death in about 15 – 38 days when the hives are actively producing honey. In the winter months the worker bee can live longer because they have well developed hypopharyngeal glands and more fat. The worker bee’s age and the needs of the colony determine the work she will do for the rest of her life. When the bee is one to three weeks of age they spend most of their time in the hive. After about three weeks of hive duties, the worker bee will take on new responsibilities because her glands that produce the larval food and wax have begun to atrophy. The adult worker bee will move away from the warm broodnest where all the eggs, larvae and pupae are stored and onto broodless combs. They will great the foragers and are eventually recruited to forage. No salary increase here and no mileage expenses. 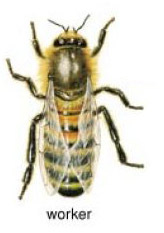 As a forager she will collect honeydew, pollen, water, nectar and propolis. Foraging activities is the most labor intensive work and will take its toll on the worker bee. Most of them die after about three weeks of foraging. It takes about 21 days for a worker bee to emerge. Honey bees are not aggressive unless they feel threatened. A worker bee will sacrifice her life to protect the colony. When she stings, she can only sting once. Once the barb is deposited into the skin her insides are pulled out as she leaves her stinger behind. DOA. Most common bee stings occur when the bee finds its way under your clothing or a glove and they feel defenseless. For the most part you can look in the hives and they are not too bothered, just don’t intrude.